Learning from Foreign Wars examines how the Russian army interpreted, and what lessons it learned from the wars in Europe between 1859 and 1871, and the American Civil War. This was a time marked by rapid change - political, social, economic and technological. By raising the question of learning from foreign wars the author attempts to fill a gap in the historiography of the Russian army. The army was one of the pillars on which the Russian regime built its power, and it was crucial for the survival of the regime both in domestic and foreign affairs. The reactions and thinking of the military at a time of rapid social, political, economic, and technological change, therefore, tell a lot about the regime's ability to adjust, develop, and ultimately survive. 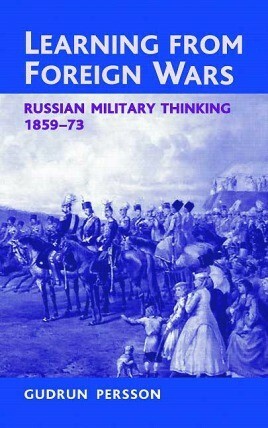 Furthermore, the influence of foreign wars on Russian strategic war planning is analyzed with the use of the first Russian war plan of 1873 and the proceedings from the strategic conference, chaired by Alexander II, in 1873. The influence of foreign wars on the General Staff officer education is also investigated. This book is largely based on extensive research in Russian archives. Special attention is given to the military attachés and, thus, the author fills a gap in the historiography of the Russian army. It uncovers the development of the military attaché institution with the use of new archival material. The Russian military attaché reports from the European Great Powers 1859-71 and the observer reports from the different theaters of war are also examined. In addition, extensive use has been made of the military press and contemporary military literature with regard to the wars. "...a useful new addition to the literature on the late Imperial Russian army."